As you know, we live in Cleveland. And before you make any snarky comments about the Browns…just, don’t…how ’bout that Tribe & Cavaliers!? Cleveland this time of year is cold, dreary, and often snowy. It’s only been two of those three as of late, but when we finally got snow, this was a dish that really hit the spot. It lasted two nights, with leftovers that this mommy did in fact, enjoy (because honestly, I don’t like leftovers). Bring a medium pot of salted water to a boil. Cook the pasta according to package instructions. Drain well and set aside in separate bowl, or spoon into your serving dishes. In a large Dutch oven or stockpot, heat 1 tbsp of the olive oil over medium heat. Add the Italian sausage and cook until browned. As the sausage cooks, make sure to break it apart into small pieces. Drain the excess grease and set it aside in a small dish. Add the remaining tablespoon of olive oil to the stockpot. Stir in the garlic, onion, carrots and celery. Cook, stirring occasionally, until the vegetables are tender. Whisk in the chicken broth to help get any ‘brown bits’ off the bottom of the pot. Add the tomato sauce, diced tomatoes, and spices. Add the Italian sausage back in, as well as 1 cup water. Bring to a boil; reduce the heat and simmer, covered, for about 10-15 minutes until the vegetables finish cooking. Set heat to low; stir in pasta and beans until heated through. Season to taste with salt and pepper. Serve immediately. In love with our new soup/pasta bowls…thank you Mom! NOTE: Add the pasta to serve or else it’ll soak up all the liquid when leftovers go into the fridge! I cooked the pasta, the put it into the soup bowls. Once the soup was finished, I ladled the soup on top of the pasta. It worked perfectly; the pasta didn’t get soggy. As you probably have noticed, I am a *huge* fan of Damn Delicious. All her recipes are, well, damn delicious! She adapted this recipe from the Olive Garden and I just knew it had to be good. You probably could omit the sausage if you wanted to or used a meat substitute with sausage seasonings (anise, red pepper), but I feel it wouldn’t be true to style if it didn’t have Italian sausage in it. However, that’s my two cents! At this moment I’m texting my parents and siblings about the crazy weather back in Cleveland, and I’m gloating about the fact that northern Michigan is not receiving any snow. It is however, bitter cold out there with temperatures just above single digits (in comparison to last year, though, these temperatures are just fine; we’ll take ’em). It is perfect soup, stew and casserole weather. Every time I make soup, I always remember how much I like to eat it and wonder why I do not make it more often. My husband is an even bigger fan of it, too. If made right, they’re satisfying, filling, and chock-full of all the stuff that’s really good for you. What’s not to love? My February schedule is, for a lack of a better word, ridiculous. I do not have a lot of time during the week to really cook and have fun doing it, so I’ve got to think ahead and be practical these next few weeks – our Crockpot in particular is really going to have to pull its weight. 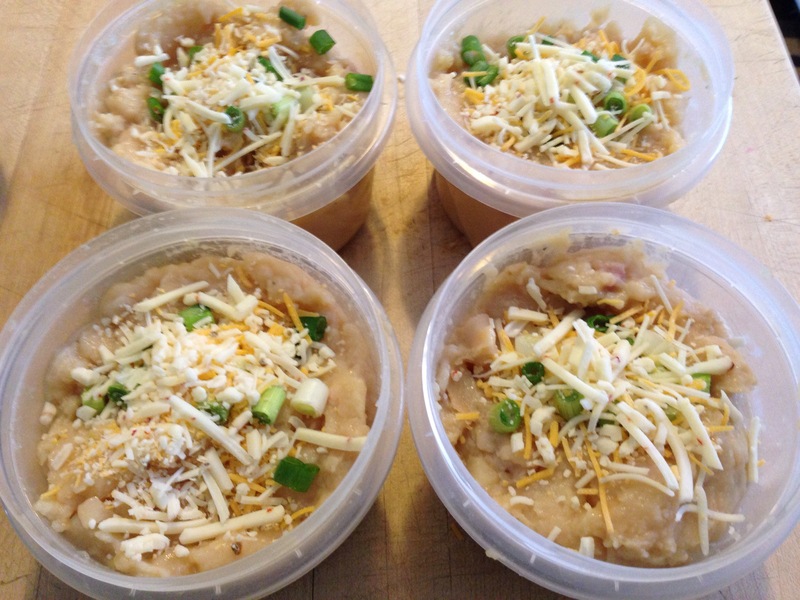 This soup is a crockpot recipe that really worked well yesterday. I spent my Saturday working in the bakery, so it was my husband’s job to finish up cooking and get dinner ready by the time I rolled in at 6:30. It’s delicious, filling and really hit the spot. In a 6 quart crockpot, add the potato, onion, broth, milk, and seasonings. Cover with the lid and cook – 4 hours on high, or 8 hours on low. When you’re about ready to eat, measure out two cups of the liquid from the slow cooker. In a medium saucepan, melt the butter over medium heat. Once the butter has melted, gradually add the flour and whisk to combine. Whisk in the reserved liquid. Once this mixture is nice and thick, pour it all back into the crockpot. At this point, you can either a) use a potato masher or emulsion blender to break down or puree the potatoes, or b) leave it alone. Whatever you decide, afterwards turn up the heat on the crockpot to high and let the mixture thicken up (it takes about 10 minutes). Once the soup is nice and thick, turn the heat to warm and stir in the sour cream. Serve topped with loaded potato ingredients, or mix ’em in. This soup was very low-maintenance and tasted great! My husband ended up adding the bacon to the soup, and leaving the cheese and scallions for topping later. We did notice that after a day or two in the refrigerator, the soup did condense a little bit – but it wasn’t anything that a little heat and stirring couldn’t fix when we were ready to eat it. What impressed me the most was using evaporated milk – I had never thought to use that for a soup before, but it makes so much sense! It adds depth and richness to a soup, without overloading it with a ton of fat like regular heavy cream or even half-n-half would. I’ve used it already in another creamy crockpot soup and it really works. Obviously this soup wouldn’t work as a vegan dish, but would be so for vegetarians or Meatless Mondays. If you’re as busy as we are, and as cold as we are, I could not recommend this soup more! Enjoy! You all know very well (or, maybe you don’t) how much I love to read cooking blogs, cookbooks, and other things of related nature. I’ve added so many to my feed that I often have trouble keeping up; I had saved so many recipes in 2014 that I got overwhelmed and deleted them all – so I’m starting fresh 🙂 I’ve had a subscription to Cooking Light for the past few years and figured that maybe it was time to save a little paper and cancel my subscription, too. I found this recipe in the last issue that I received. It was so good that I may change my mind and keep my subscription after all…and maybe just do the digital subscription instead! In a small bowl, whisk the stock and flour together. Set aside. In a medium bowl, combine 1 tbsp of the oil, the lemon juice, and garlic powder. Add the chicken and toss to coat. Let marinate at room temperature for 30 minutes (or in the refrigerator for a few hours). When you’re ready to cook, heat a large skillet over medium-high heat and coat with cooking spray. Remove the chicken from the marinade (discard the marinade) and add to pan. Sprinkle with salt and pepper; cook about 5 minutes on each side until the chicken is done cooking. When the chicken is done, remove it from the pan onto a plate or dish and set aside. Reduce the heat to medium and add the remaining tablespoon of olive oil; swirl pan to coat. Add the shallots, rosemary, and pancetta, cooking until the shallots are tender. Add the garlic and cook for 30 seconds. Add the sherry to the pan and let the liquid reduce (about 4 minutes or so). As the liquid boils down, scrape the pan to loosen the browned bits. Add the stock/flour mixture and bring to a simmer. Add artichokes and cook until the sauce thickens just a bit. Add chicken and turn to coat. Sprinkle with parsley. This photo is proof that I may be the worse plater ever. 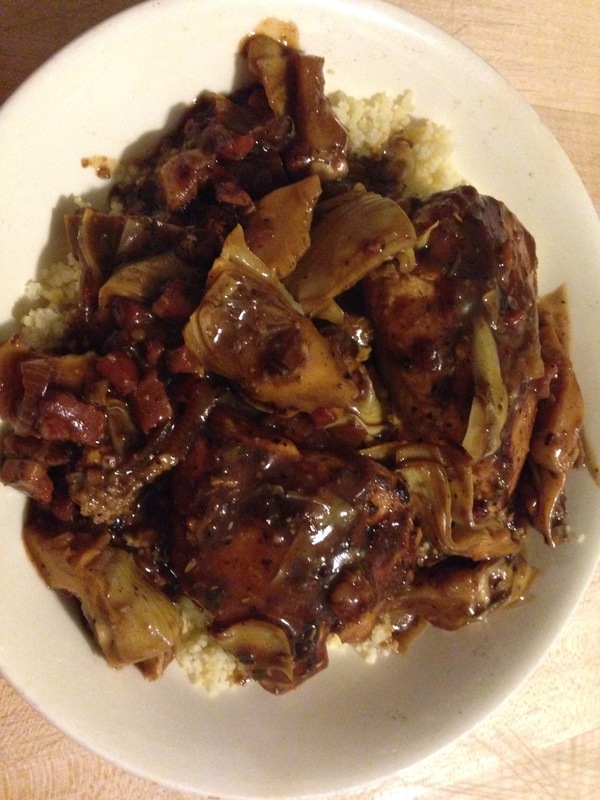 Don’t let this *awful* picture fool you – looks can be deceiving as this dish was terrific! I realize after the fact that I let the mixture thicken a little too much after adding the stock/flour to the pan. The chicken has a great lemon flavor to it that compliments the richness of rosemary-pancetta pan sauce. The artichokes only add to the depth of flavors. I served it atop some couscous I had in my pantry, but you can use rice or orzo if you’d prefer. I served this along with some braised kale – which paired really well with it. According to my husband, his portion reheated very well. Not only was this dish tasty…it didn’t take very long to make! Make sure to marinate the chicken ahead of time – I did it several hours before and was able to complete the dish in a half an hour after coming home from work. Okay – I feel better now 🙂 I made a dish that didn’t fail; granted it’s a tried and true recipe and the previous ones were ones that I hadn’t tried before. Even so, I feel like less of a failure and I feel that it’s relatively post-worthy. Look at one of my pretty Christmas gifts from my husband! 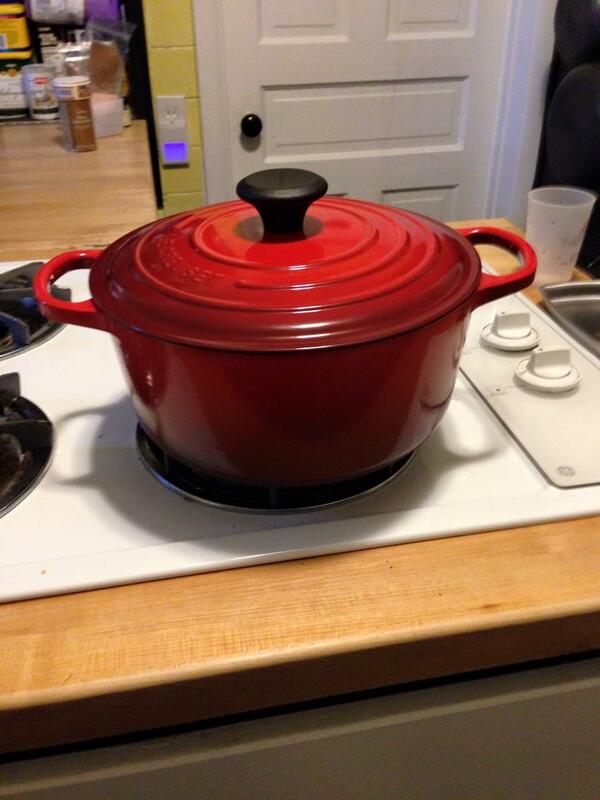 A gorgeous red Le Creuset dutch oven. I’m so in love with it. I’ve been wanting one for quite a while and he remembered…I wasn’t picky about the color, but I do like red things for my kitchen so again, he remembered! I’m not very well-versed in cookware like this, so I still have a lot to learn in terms of what I can and cannot cook in it. I figure “low and slow” is a good mantra for this pot – soups, stews, and dishes that need at least a good 30-45 minutes to meld together. I am proud of the fact, however, that I remembered that it’s a coated cast iron pot – meaning that you need to wear oven mitts whenever dealing with it or else you risk some major burns. This is also a step in the right direction for me, as I’m that person that will carelessly forget when a pan has been in the oven, and will accidentally grab it with my bare hands when I’m ready to serve it (my husband will vouch for me on this one). Anyways – it’s winter time. It’s pep band season. We’re working a lot, and to save a little bit of cash, we need dinners that are going to last us a while so we’re not stopping at the store for a quick meal or even *ugh* fast food. Dinners that are still delicious and (relatively) healthy, but still stick to the ribs to keep us warm. Know what I mean? I thought about something to cook this week with my new pot, and immediately thought of chicken cacciatore! 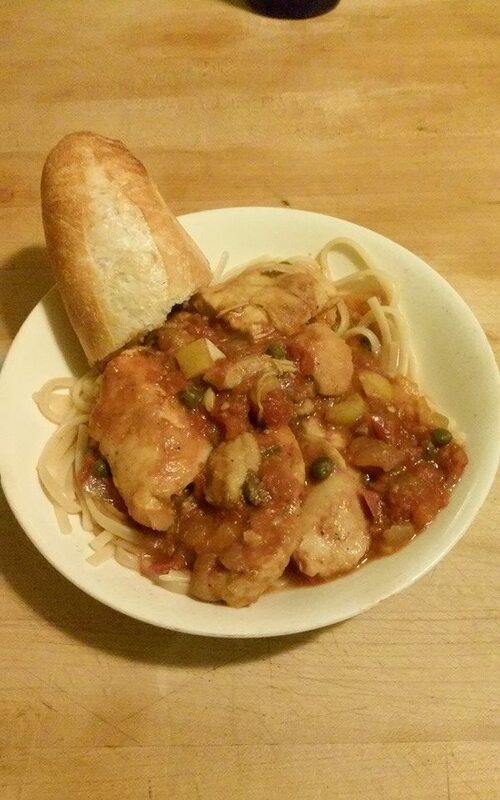 Chicken cacciatore is “hunter-style” chicken; chicken with mushrooms, onion, and tomatoes. It’s a hearty dish that fills you up, goes a long way and tastes amazing. The recipe that I based my dish off of, however, doesn’t include mushrooms! I think I’ll have to make a note in my cookbook for next time. Sprinkle the chicken pieces with salt and pepper. On a plate or in a shallow bowl, dredge the chicken pieces in the flour to coat. In a large heavy saute pan or Dutch oven, heat the oil over medium-high heat. Add the chicken to the pan and saute just until they’re just brown (~5 minutes). Do not crowd the pan; feel free to brown the chicken in 2 batches. Transfer the chicken to a plate and set aside. Reduce the heat to medium and wait two minutes. Add the bell pepper, onion and garlic to the same pan and saute until the onion softens. Season the vegetables with salt and pepper. Add the wine and simmer until the liquid reduced by half (~3-5 minutes). Add the entire can of diced tomatoes (including the juice), broth, capers and oregano. Stir to combine. Return the chicken to the pan and coat it in the sauce. Bring the sauce to a simmer, then reduce the heat to medium-low. Simmer for about 20 minutes, until all the chicken is cooked through and the flavors have melded together. Serve hot, sprinkled with basil and with pasta if desired. As I said in the recipe, you can serve with or without pasta. This makes a lot of sauce and leftovers reheat really well. I had mine with a piece of baguette from work on the side to pick up any last sauce that was leftover in the dish. This post is excruciatingly belated – partly because I’m behind in blogging, and partly because I wanted to wait until the weather started to turn to post this recipe. Thanks to my husband, I’ve grown to really love and appreciate having soup for dinner. It makes great leftovers and is a satisfying meal; with my culinary ADD, the more veggies and herbs, the better! 🙂 Thus it’s now fall and I’m *finally* ready for soups and stews. I came across this recipe back in August, when my CSA was chock-full of tomatoes and eggplant. Especially eggplant. I had a Sunday afternoon to play around in my kitchen, and I decided to make this soup ahead of time to freeze for cooler weather. I’m thankful that I did – this soup really hit the spot during our first chilly week up here! Preheat oven to 425 degrees . Make sure that you have two racks in your oven, towards the middle. On a baking sheet, toss together the tomatoes carrots, garlic, and half of the oil. Spread into a single layer and arrange the tomatoes with cut sides down. Sprinkle with salt and pepper. On another baking sheet, toss together the eggplant, chickpeas, curry powder, and the rest of the oil. Spread in a single layer. Place both sheets in oven, putting the tomato mixture on the higher rack. Roast until the veggies are tender for 45-50 minutes, tossing each mixture halfway through. Remove baking sheets from oven. Using tongs, peel off the skins from the tomatoes & discard the skins. Transfer the tomato mixture into a large pot and puree with an immersion blender (if you don’t have one, use a food processor or blender). Thin with 2-3 cups of water; add eggplant mixture and continue to blend. Add an additional cup of water if desired. Turn on heat to medium-high and bring the soup to a simmer. Season with salt and pepper. Serve topped with cilantro and with a side of crusty bread. Because of the chickpeas, this soup is ridiculously filling – thus a little goes a long way! Since I had made it ahead of time and froze it, the soup was a snap to defrost and eat on a chilly Monday. The cilantro adds a nice touch to it, and of course we ate it with some fresh bread! While the ingredients may be a little out of ordinary, they are all things that can be found in your local grocery store (or CSA). You could even save yourself the step of peeling tomatoes by using canned tomatoes; just roast the garlic with the chickpeas. Oh yeah – I realized after the fact that this soup is also vegan! 🙂 So, hooray for a satisfying soup that is filling, nutritious, and contains no animal products whatsoever (even though we all know that I am borderline meatatarian). Try this – you won’t be disappointed! …anyway, the squash that we received during our CSA this past summer has lasted a relatively long time. In fact, I still have some laying around and it needs to be used up. 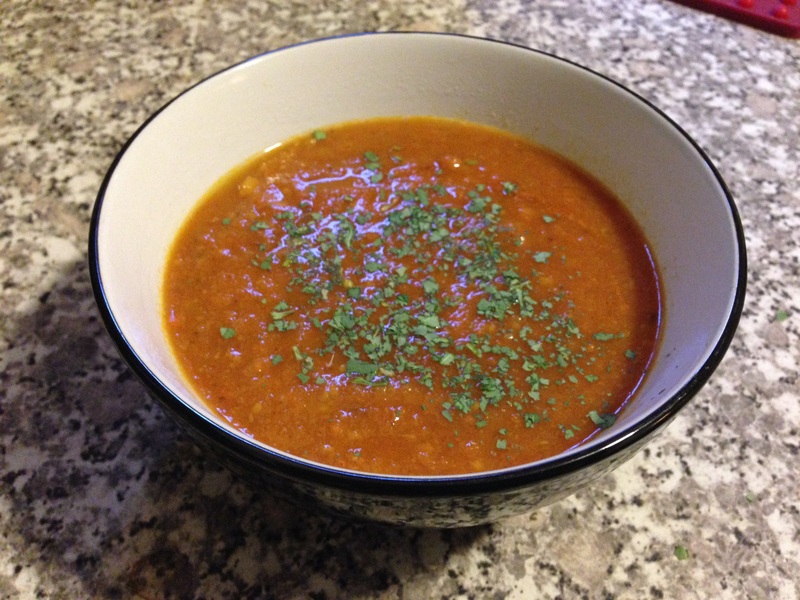 This soup that I made utilized the acorn squash that I hadn’t used yet. This really hit the spot on a cold snowy day when basketball & pep band were cancelled. You need to do one of two things with this recipe: either 1) roast the squash ahead of time, or 2) have a good 2+ hours to make dinner. Trust me on this one. DO THIS STEP AHEAD OF TIME IF NEEDED: Preheat the oven to 350*. Cut the squash in half on the equator and remove the seeds with a spoon. Cut a flat spot on each end so the squash will lay flat. Line a baking sheet with foil and on, lay the squash, cut side up. To 3 of the halves, add a whole shallot. To the other 3 add 2 cloves of garlic. Sprinkle with salt & pepper and drizzle with 2 tbsp of the oil. Roast in the oven until very tender; approximately 1 hour. Remove from oven & when cool enough to touch, scoop the squash from the skin, keeping the roasted shallots & garlic with the scooped squash. In a large Dutch oven, heat 1 tbsp of oil and the butter over medium-high heat. Add the raw, diced shallots & saute until they begin to carmelize. Deglaze the pan with 1/2 cup of the stock and stir to remove any bits of shallot off of the bottom of the pan. Reduce the heat and add the squash, roasted shallots & roasted garlic. Stir,then add in the remaining stock. Stir to combine, then puree with a stick blender. Add in the cayenne, white pepper, and herbs. Stir to combine, then add the cream and Worcestershire. Heat over medium-low heat, stirring occasionally until it begins to simmer. Once you have a slow simmer going, use the stick blender again to puree the soup until it is nice and smooth. Stir in the parmesan and reduce the heat to low. We had some fresh bread with ours…mmm! While making this soup, I finally realized why I haven’t used up all of my squash yet – I really don’t like all the scooping & scraping that comes with its preparation. If only there were an easier way…I really do like how squash is such a palette for flavors, but I really don’t like all the work that goes into it. 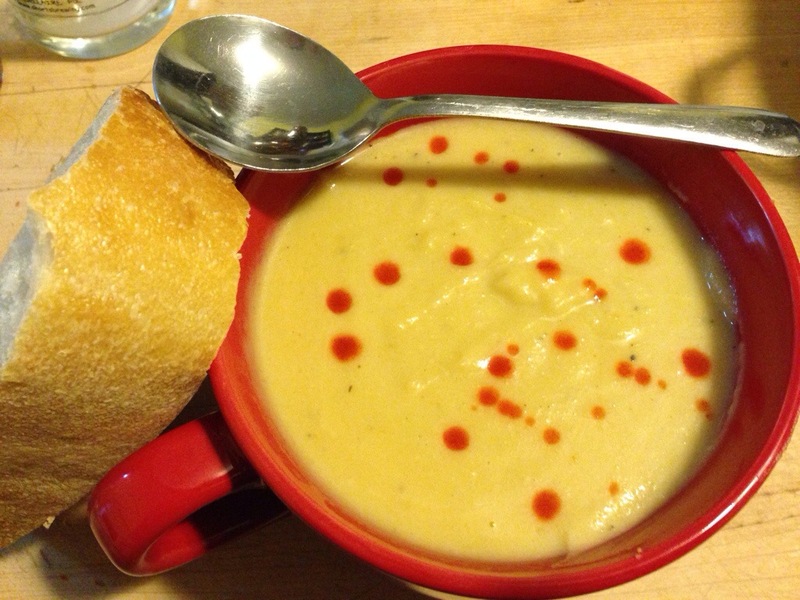 Make sure that if you can, get some fresh bread to eat with this soup! I picked up a loaf of Breadworks Italian and it was really fantastic for getting the last spoonfuls out of the bowl. The older I get, the more I realize that soup can truly be a comfort food. …but on the bright side, it’s time once again for soup, stews & chili. Yum. I came across this recipe over at In Her Chucks. It’s a great blog – I really enjoy reading it (hint: check it out!). This dish is a great meal for a chili fall evening; I especially am glad that it uses bell peppers. That is one thing I have a lot of right now…green bell peppers! Which, truthfully, I’m not a fan of on their own. But, I will eat them in chili. I promise. Heat the oil in a large pot over medium-high heat. Add the aromatics and peppers, stirring often until they are cooked. Add the turkey & cook until brown. Reduce heat to low and add the kidney beans. Cover & simmer for about 30 minutes, stirring occasionally. Serve like any other chili – in our house, that means with crackers, cheddar cheese, raw onion or scallions, and spaghetti! If you don’t have canned or fresh pumpkin laying around, you can use a winter squash or maybe even butternut squash. I though this would be a good way, though, to use pumpkin that may have arrived in your CSA, or that you simply see at the store next time you go grocery shopping. It’s not too hard to make your own pumpkin puree, so I’ve found! I’ll be using this technique to attack the winter squash & pumpkins that are looking decorative in my dining room since I’m out of pantry space.